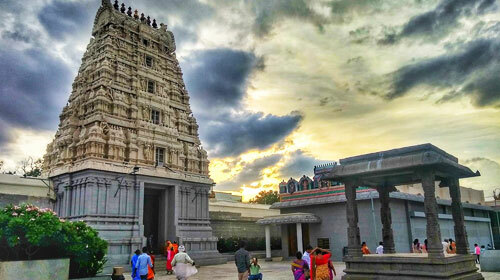 The Kamakshi Amman temple was probably built by the Pallava kings whose capital was in Kanchipuram. But the origins of the building of the temple or who originally built is not known and may forever be lost to antiquity. This ancient temple, dedicated to the goddess Kamakshi, is one of the most important centres of worship devotees of this deity. Here the Goddess Parvathy appears in her guise as Kamakshi meaning ‘The goddess who accedes all requests’. The goddess in the main shrine appears as sitting in a Yogic posture. There are eight other goddess forms surrounding the temple. Legend has it that the goddess worshipped Lord Shiva and built a mud idol in Kanchi. Shiva in order to test her devotion incarnated as the Kamba river and threatened the idol with high waters. On seeing this the goddess tightly grasped the idol to protect it from the upcoming water. The goddess also performed a penance by sitting on a needle tip surrounded by fire. Lord Shiva became pleased with her devotion, appeared before her and married her. The temple is open from 5.30 am to 12.15 pm and between 4.00 pm to 8.15 pm. The temple celebrates the usual goddess festivals and Fridays which are considered sacred in Hinduism. Other special festivals include Navarathiri, Theppam festival, Ther festival and the Fridays during the Tamil months of Adi and Thai are auspicious.